Because student accountability is tough. But it’s also one of the slipperiest slopes in education. On the one hand, we have a desire for/belief in students’ ability to grow, and expectations for responsibility. On the other hand, we have a desire to both exemplify and show compassion, patience, and developmental understanding. Amid the missing papers, messy desks, and forgotten lunch ID numbers, it’s easy in our exasperation to want to point across the table at that little human’s deficiencies. To implement stricter consequences. 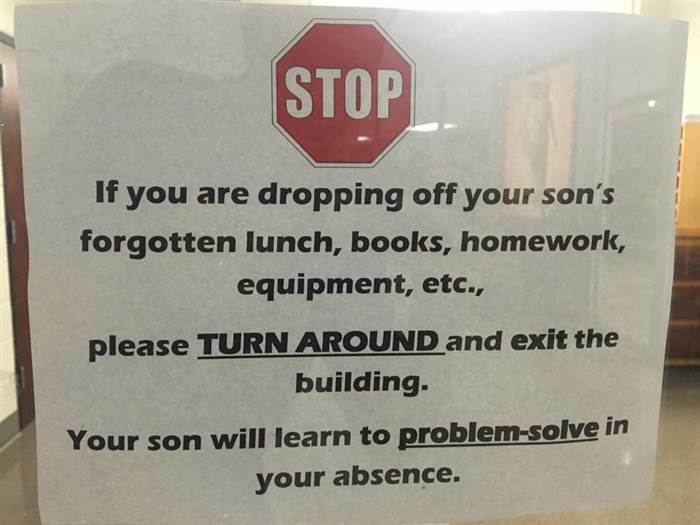 To put up more posters on students taking responsibility. In other words, it’s easy to put it all on the children in front of us, sitting across from them instead of “sitting next to” them (see Engaged Feedback Checklist below) to look at the issues together. I don’t necessarily believe there’s never a place for the sentiment or action displayed in the above photos in specific contexts. BUT at the same time, I wonder how the culture in our classrooms would be impacted if these kinds of posters plastered our schools instead. Yes, student accountability is messy. But I think we do a better job navigating it if, instead of trying to create one-size-fits-all zero-tolerance policies, we choose to simply accept the messiness and focus on the relationships. Come back next Friday for another “Learning Through Reflecting” post. Read here for the rest of my weekly blogging topic schedule/background.